Mornings are for muffins and cuddles. Yes, both. I love getting those morning cuddles from my kids when I first wake up. They crawl into my bed and give me the big squeezes I need before starting my day. I’m so not a morning person, but even if I’m grumpy, I will never resist morning cuddles. Actually, it just makes me want to go back to sleep! After all those snuggles, it’s time to make some coffee and some muffins! My love for all things citrus is still going strong. 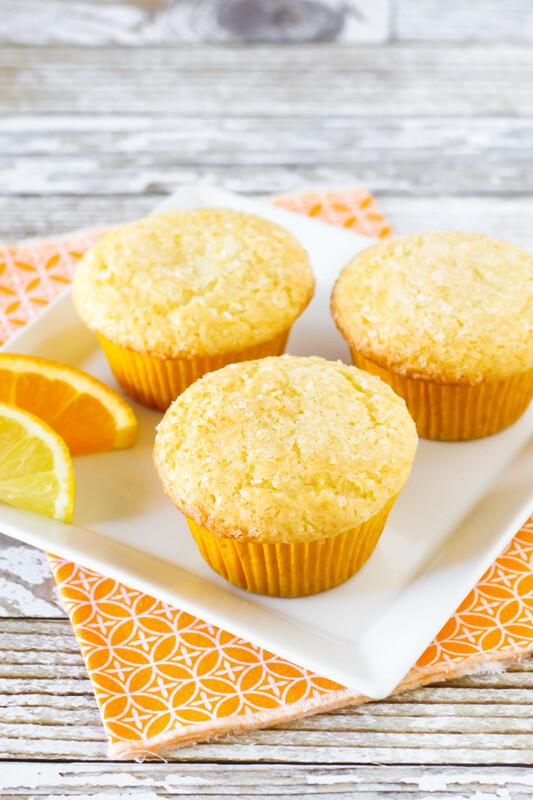 These muffins are a mixture of both orang and lemon. So bright and fresh. The zest is essential and the juice helps to keep these muffins light and moist. To give this morning treat a little texture, I topped each muffin with a sprinkling of sparkling sugar. Never a bad idea. Are these my new favorite muffin recipe? I could easily say “YES!” At least for now, until it’s fall and pumpkin season starts back up. 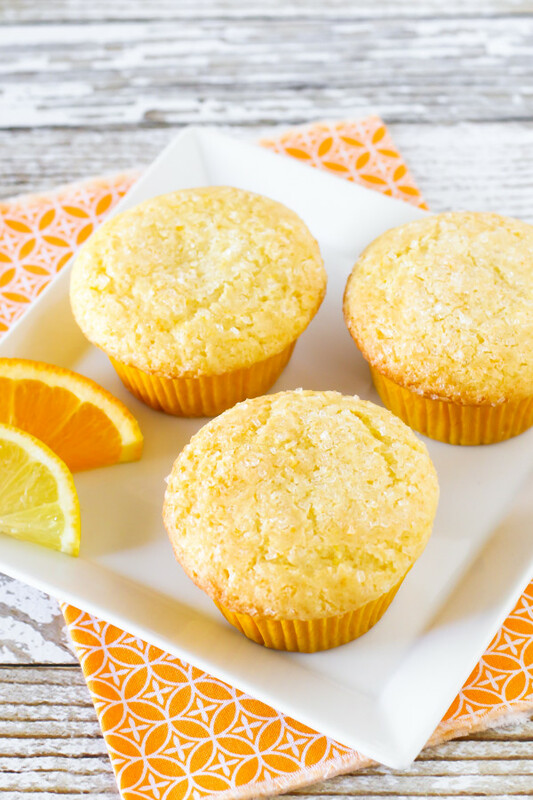 I call these my sunshine citrus muffins because they are like a ray of sunshine. They bring a delicious brightness to any morning! Preheat oven to 350 degrees. Line cupcake pan with cupcake liners or spray with nonstick cooking spray. 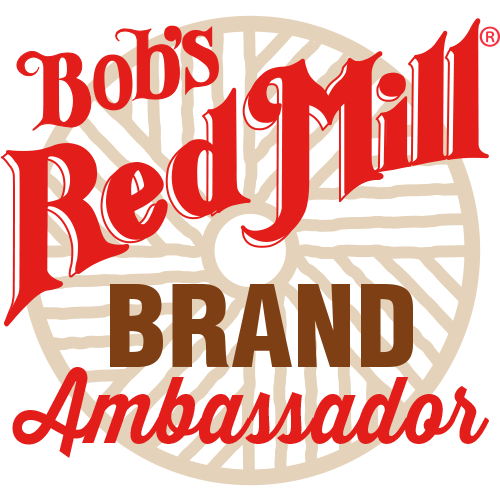 In large mixing bowl, whisk together flour, sugar, baking powder, baking soda and salt. Add orange zest and lemon zest. Whisk to combine. To flour mixture, pour in coconut milk, orange juice, melted shortening, lemon juice and vanilla. Stir just until batter is smooth. Divide batter into prepared cupcake pan. Sprinkle tops of muffins with sparkling sugar. Bake muffins 18-22 minutes, until golden brown. Remove from pan and place on cooling rack to cool completely. Orange+muffins is THE best combo! Gonna have to try these. Pinned! These look so bright and sunny. Perfect for summer breakfasts! These muffins looks like a ray of sunshine! How can you not have a good day when you eat one of those? These are delicious! I used regular flour, but they still turned out perfect. Nice and citrus-y but still sweet. I’ll definitely be making these again! I first I wasn’t sure about making citrus muffins. I am new to gluten free dairy free baking. My hobby is baking and I am re-learning how to bake. I made a batch yesterday. After tasting them I wasn’t let down. I used the glaze recipe from your lemon muffins put on top. I am in heaven. I use the muffins in place of cupcakes. Love the glaze idea! So glad you enjoyed them! They came out great, thanks! I doubled the recipe with really orange oranges for the zest but it wasn’t nearly that bright, did you use natural food coloring?